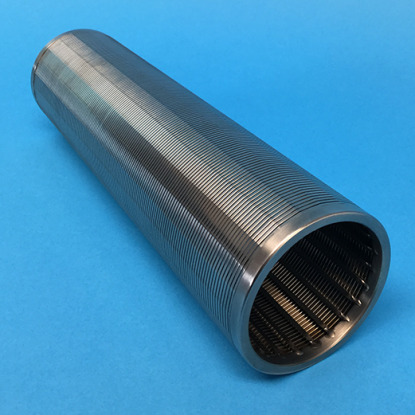 316L SS Wedge Wire Strainer Element. Standard construction includes a wrap wire with internal support rods. Flow; Out to In. Withstands 150# Collapse Pressure. All welded construction. Wedge Wire can be supplied with any slot opening size! If you require a slot opening size other than those shown, please consult our factory. 12 mesh equivalent (0.060" slot opening) with Weld Ring at each end of strainer element. Replaces Perforated Support Core and/or Wire Mesh OverScreen. Fits Inlet Strainer Assembly (SHORT) line sizes 1", 1.5", and 2.0"
12 mesh equivalent (0.060" slot opening) with Weld Ring at each end of strainer element. Replaces Perforated Support Core and/or Wire Mesh OverScreen. Fits Inlet Strainer Assembly (SHORT) line sizes 2.5", 3.0", and 4.0"
14 mesh equivalent (0.051" slot opening) with Weld Ring at each end of strainer element. Replaces Perforated Support Core and/or Wire Mesh OverScreen. Fits Inlet Strainer Assembly (SHORT) line sizes 1", 1.5", and 2.0"
14 mesh equivalent (0.051" slot opening) with Weld Ring at each end of strainer element. Replaces Perforated Support Core and/or Wire Mesh OverScreen. Fits Inlet Strainer Assembly (SHORT) line sizes 2.5", 3.0", and 4.0"
16 mesh equivalent (0.045" slot opening) with Weld Ring at each end of strainer element. Replaces Perforated Support Core and/or Wire Mesh OverScreen. Fits Inlet Strainer Assembly (SHORT) line sizes 1", 1.5", and 2.0"
16 mesh equivalent (0.045" slot opening) with Weld Ring at each end of strainer element. Replaces Perforated Support Core and/or Wire Mesh OverScreen. Fits Inlet Strainer Assembly (SHORT) line sizes 2.5", 3.0", and 4.0"
18 mesh equivalent (0.039" slot opening) with Weld Ring at each end of strainer element. Replaces Perforated Support Core and/or Wire Mesh OverScreen. Fits Inlet Strainer Assembly (SHORT) line sizes 1", 1.5", and 2.0"
18 mesh equivalent (0.039" slot opening) with Weld Ring at each end of strainer element. Replaces Perforated Support Core and/or Wire Mesh OverScreen. Fits Inlet Strainer Assembly (SHORT) line sizes 2.5", 3.0", and 4.0"
20 mesh equivalent (0.034" slot opening) with Weld Ring at each end of strainer element. Replaces Perforated Support Core and/or Wire Mesh OverScreen. Fits Inlet Strainer Assembly (SHORT) line sizes 1", 1.5", and 2.0"
20 mesh equivalent (0.034" slot opening) with Weld Ring at each end of strainer element. Replaces Perforated Support Core and/or Wire Mesh OverScreen. Fits Inlet Strainer Assembly (SHORT) line sizes 2.5", 3.0", and 4.0"
24 mesh equivalent (0.028" slot opening) with Weld Ring at each end of strainer element. Replaces Perforated Support Core and/or Wire Mesh OverScreen. Fits Inlet Strainer Assembly (SHORT) line sizes 1", 1.5", and 2.0"
24 mesh equivalent (0.028" slot opening) with Weld Ring at each end of strainer element. Replaces Perforated Support Core and/or Wire Mesh OverScreen. Fits Inlet Strainer Assembly (SHORT) line sizes 2.5", 3.0", and 4.0"
30 mesh equivalent (0.020" slot opening) with Weld Ring at each end of strainer element. Replaces Perforated Support Core and/or Wire Mesh OverScreen. Fits Inlet Strainer Assembly (SHORT) line sizes 1", 1.5", and 2.0"
30 mesh equivalent (0.020" slot opening) with Weld Ring at each end of strainer element. Replaces Perforated Support Core and/or Wire Mesh OverScreen. Fits Inlet Strainer Assembly (SHORT) line sizes 2.5", 3.0", and 4.0"
40 mesh equivalent (0.015" slot opening) with Weld Ring at each end of strainer element. Replaces Perforated Support Core and/or Wire Mesh OverScreen. Fits Inlet Strainer Assembly (SHORT) line sizes 1", 1.5", and 2.0"
40 mesh equivalent (0.015" slot opening) with Weld Ring at each end of strainer element. Replaces Perforated Support Core and/or Wire Mesh OverScreen. Fits Inlet Strainer Assembly (SHORT) line sizes 2.5", 3.0", and 4.0"
50 mesh equivalent (0.011" slot opening) with Weld Ring at each end of strainer element. Replaces Perforated Support Core and/or Wire Mesh OverScreen. Fits Inlet Strainer Assembly (SHORT) line sizes 1", 1.5", and 2.0"
50 mesh equivalent (0.011" slot opening) with Weld Ring at each end of strainer element. Replaces Perforated Support Core and/or Wire Mesh OverScreen. Fits Inlet Strainer Assembly (SHORT) line sizes 2.5", 3.0", and 4.0"
60 mesh equivalent (0.009" slot opening) with Weld Ring at each end of strainer element. Replaces Perforated Support Core and/or Wire Mesh OverScreen. Fits Inlet Strainer Assembly (SHORT) line sizes 1", 1.5", and 2.0"
60 mesh equivalent (0.009" slot opening) with Weld Ring at each end of strainer element. Replaces Perforated Support Core and/or Wire Mesh OverScreen. Fits Inlet Strainer Assembly (SHORT) line sizes 2.5", 3.0", and 4.0"
80 mesh equivalent (0.007" slot opening) with Weld Ring at each end of strainer element. Replaces Perforated Support Core and/or Wire Mesh OverScreen. Fits Inlet Strainer Assembly (SHORT) line sizes 1", 1.5", and 2.0"
80 mesh equivalent (0.007" slot opening) with Weld Ring at each end of strainer element. Replaces Perforated Support Core and/or Wire Mesh OverScreen. Fits Inlet Strainer Assembly (SHORT) line sizes 2.5", 3.0", and 4.0"
100 mesh equivalent (0.0055" slot opening) with Weld Ring at each end of strainer element. Replaces Perforated Support Core and/or Wire Mesh OverScreen. Fits Inlet Strainer Assembly (SHORT) line sizes 1", 1.5", and 2.0"
100 mesh equivalent (0.0055" slot opening) with Weld Ring at each end of strainer element. Replaces Perforated Support Core and/or Wire Mesh OverScreen. Fits Inlet Strainer Assembly (SHORT) line sizes 2.5", 3.0", and 4.0"
12 mesh equivalent (0.060" slot opening) with Weld Ring at each end of strainer element. Replaces Perforated Support Core and/or Wire Mesh OverScreen. Fits Inlet Strainer Assembly (LONG) line sizes 1", 1.5", and 2.0"
12 mesh equivalent (0.060" slot opening) with Weld Ring at each end of strainer element. Replaces Perforated Support Core and/or Wire Mesh OverScreen. Fits Inlet Strainer Assembly (LONG) line sizes 2.5", 3.0", and 4.0"
14 mesh equivalent (0.051" slot opening) with Weld Ring at each end of strainer element. Replaces Perforated Support Core and/or Wire Mesh OverScreen. Fits Inlet Strainer Assembly (LONG) line sizes 1", 1.5", and 2.0"
14 mesh equivalent (0.051" slot opening) with Weld Ring at each end of strainer element. Replaces Perforated Support Core and/or Wire Mesh OverScreen. Fits Inlet Strainer Assembly (LONG) line sizes 2.5", 3.0", and 4.0"
16 mesh equivalent (0.045" slot opening) with Weld Ring at each end of strainer element. Replaces Perforated Support Core and/or Wire Mesh OverScreen. Fits Inlet Strainer Assembly (LONG) line sizes 1", 1.5", and 2.0"
16 mesh equivalent (0.045" slot opening) with Weld Ring at each end of strainer element. Replaces Perforated Support Core and/or Wire Mesh OverScreen. Fits Inlet Strainer Assembly (LONG) line sizes 2.5", 3.0", and 4.0"
18 mesh equivalent (0.039" slot opening) with Weld Ring at each end of strainer element. Replaces Perforated Support Core and/or Wire Mesh OverScreen. Fits Inlet Strainer Assembly (LONG) line sizes 1", 1.5", and 2.0"
18 mesh equivalent (0.039" slot opening) with Weld Ring at each end of strainer element. Replaces Perforated Support Core and/or Wire Mesh OverScreen. Fits Inlet Strainer Assembly (LONG) line sizes 2.5", 3.0", and 4.0"
20 mesh equivalent (0.034" slot opening) with Weld Ring at each end of strainer element. Replaces Perforated Support Core and/or Wire Mesh OverScreen. Fits Inlet Strainer Assembly (LONG) line sizes 1", 1.5", and 2.0"
20 mesh equivalent (0.034" slot opening) with Weld Ring at each end of strainer element. Replaces Perforated Support Core and/or Wire Mesh OverScreen. Fits Inlet Strainer Assembly (LONG) line sizes 2.5", 3.0", and 4.0"
24 mesh equivalent (0.028" slot opening) with Weld Ring at each end of strainer element. Replaces Perforated Support Core and/or Wire Mesh OverScreen. Fits Inlet Strainer Assembly (LONG) line sizes 1", 1.5", and 2.0"
24 mesh equivalent (0.028" slot opening) with Weld Ring at each end of strainer element. Replaces Perforated Support Core and/or Wire Mesh OverScreen. Fits Inlet Strainer Assembly (LONG) line sizes 2.5", 3.0", and 4.0"
30 mesh equivalent (0.020" slot opening) with Weld Ring at each end of strainer element. Replaces Perforated Support Core and/or Wire Mesh OverScreen. Fits Inlet Strainer Assembly (LONG) line sizes 1", 1.5", and 2.0"
30 mesh equivalent (0.020" slot opening) with Weld Ring at each end of strainer element. Replaces Perforated Support Core and/or Wire Mesh OverScreen. Fits Inlet Strainer Assembly (LONG) line sizes 2.5", 3.0", and 4.0"
40 mesh equivalent (0.015" slot opening) with Weld Ring at each end of strainer element. Replaces Perforated Support Core and/or Wire Mesh OverScreen. Fits Inlet Strainer Assembly (LONG) line sizes 1", 1.5", and 2.0"
40 mesh equivalent (0.015" slot opening) with Weld Ring at each end of strainer element. Replaces Perforated Support Core and/or Wire Mesh OverScreen. Fits Inlet Strainer Assembly (LONG) line sizes 2.5", 3.0", and 4.0"
50 mesh equivalent (0.011" slot opening) with Weld Ring at each end of strainer element. Replaces Perforated Support Core and/or Wire Mesh OverScreen. Fits Inlet Strainer Assembly (LONG) line sizes 1", 1.5", and 2.0"
50 mesh equivalent (0.011" slot opening) with Weld Ring at each end of strainer element. Replaces Perforated Support Core and/or Wire Mesh OverScreen. Fits Inlet Strainer Assembly (LONG) line sizes 2.5", 3.0", and 4.0"
60 mesh equivalent (0.009" slot opening) with Weld Ring at each end of strainer element. Replaces Perforated Support Core and/or Wire Mesh OverScreen. 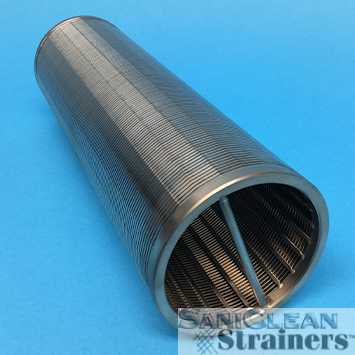 Fits Inlet Strainer Assembly (LONG) line sizes 1", 1.5", and 2.0"
60 mesh equivalent (0.009" slot opening) with Weld Ring at each end of strainer element. Replaces Perforated Support Core and/or Wire Mesh OverScreen. Fits Inlet Strainer Assembly (LONG) line sizes 2.5", 3.0", and 4.0"
80 mesh equivalent (0.007" slot opening) with Weld Ring at each end of strainer element. Replaces Perforated Support Core and/or Wire Mesh OverScreen. Fits Inlet Strainer Assembly (LONG) line sizes 1", 1.5", and 2.0"
80 mesh equivalent (0.007" slot opening) with Weld Ring at each end of strainer element. Replaces Perforated Support Core and/or Wire Mesh OverScreen. Fits Inlet Strainer Assembly (LONG) line sizes 2.5", 3.0", and 4.0"
100 mesh equivalent (0.0055" slot opening) with Weld Ring at each end of strainer element. Replaces Perforated Support Core and/or Wire Mesh OverScreen. Fits Inlet Strainer Assembly (LONG) line sizes 1", 1.5", and 2.0"
100 mesh equivalent (0.0055" slot opening) with Weld Ring at each end of strainer element. Replaces Perforated Support Core and/or Wire Mesh OverScreen. Fits Inlet Strainer Assembly (LONG) line sizes 2.5", 3.0", and 4.0"